Clydesdale Western 1st XI’s hopes of back-to-back indoor titles ended in defeat after they fell to a strong and clinical Dundee Wanderers display at Bell’s Sports Centre. 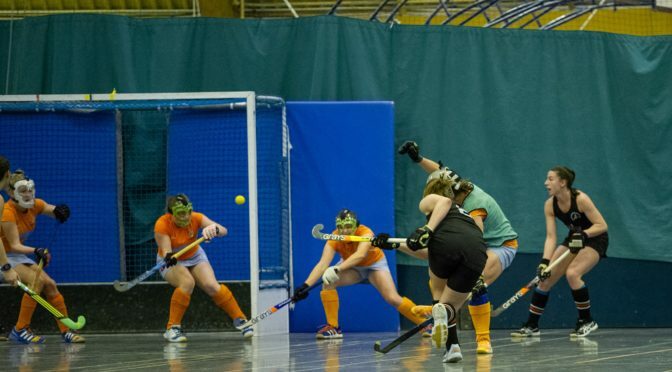 ‘Dale Western were hoping to repeat their success in the Women’s Grand Indoor Play-Off Final back in 2018, when they won 4-2 against the same opponents. But Wanderers were determined to avoid any disappointment this time round and they duly obliged as they got off to a flyer, scoring twice inside the first ten minutes. The first saw a first time deflection from Ruth Blaikie, receiving a pass from a defensively positioned team mate. It was then 2-0 when Charlotte Watson showed close skills in the circle before finding space to send a shot past ‘Dale Western goalkeeper, Jessica Buchanan. The L1s kept in the game after, but on the stroke of half-time, Wanderers were awarded a penalty flick, which was converted by Watson again for 3-0. The Titwood side did their best to step up to force a goal back in the second half. But their opponents scored the fourth goal of the game, winning possession on the halfway line, before a pass set Wanderers’ Heather Elder in to round Buchanan and slot home. ‘Dale Western decided to go with six outfield players to press two to the ball and did eventually pull a goal back. A move down the right saw the ball squared across goal for Millie Steiger to tap in at the back post. Unfortunately, Steiger’s goal had an adverse affect, as Dundee Wanderers would effectively go on to end the contest by scoring the next three goals in four second half minutes to take an unassailable 7-1 lead. With no goalkeeper for the L1s during play, Wanderers won a penalty corner which was converted high for 1-5 by Emily Dark. The Dundee side then won another flick for goal number six, converted again by Watson despite Buchanan returning to the goals for the set piece. Ellie Watson then added Wanderers seventh goal from another corner. Clydesdale Western grabbed a consolation two minutes from time when Steiger combined with Heather Howie to score her and her team’s second goal of the game. 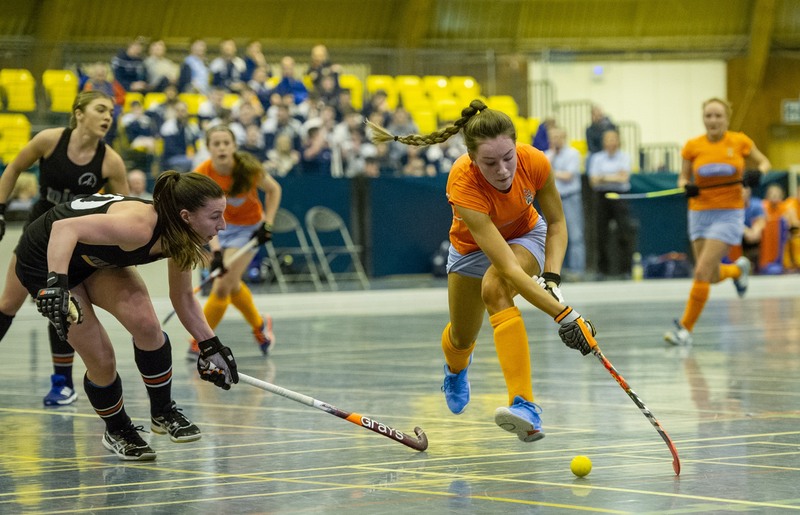 But that was how the game finished, as Dundee Wanderers claimed the Indoor Championship and sealed their place in European competition for 2020. Clydesdale Men’s 5s away to defeat to Helensburgh 3s was the only outdoor game that played over the weekend. There was a total of six scheduled matches that were due to take place, but the M3s, M4s, L4s, L5s and L6s games were called off due to the recent low temperatures making a number of pitches unplayable. The M5s, however, did manage to play in their Men’s West District Division Three match with Helensburgh 3s, but succumbed to a 3-0 defeat. Despite the result, the club are immensely proud of Clydesdale Western 1st XI Indoor Squad for the efforts they put in throughout the whole season. Many thanks to all who represented, and extra thanks to coaches Wendy and Peter Justice for their commitment and dedication during the season. The L1s still have European competition in less than two weeks time in Vienna, so best of luck again to ‘Dale Western! The girls are also hosting a Ceilidh on Saturday 9th February at Carmichael Hall – tickets (which cost £20.00 for adults, £10.00 for U18s and FREE for U14s attending with an adult) can be bought from behind the bar or from your relevant team captains.